Photos by Cheryl Wertman – Roy-Hart centerfielder Gavyn Boyle makes a diving catch during the Rams key win over Medina at Vets Park this afternoon. 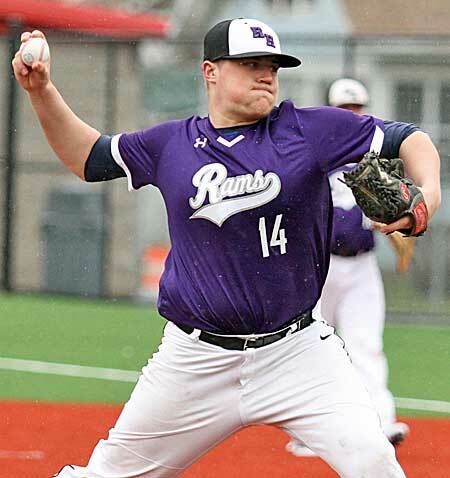 Defending champion Roy-Hart pushed across a pair of runs in the top of the eighth inning to hand Medina its first league loss by a 5-3 margin in a key Niagara-Orleans contest at rainy Vets Park this afternoon. 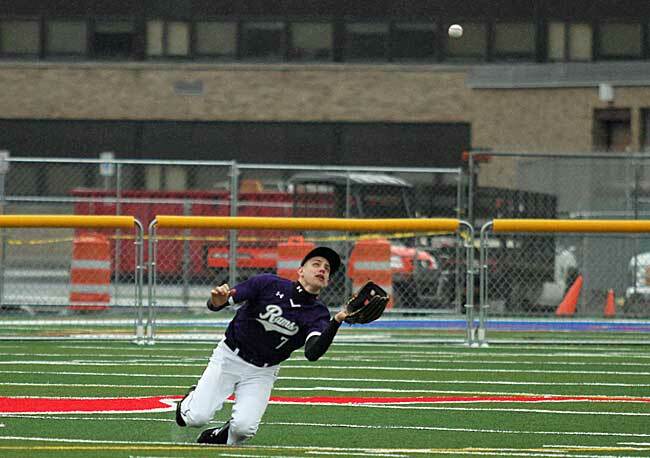 Breaking away from a 3-3 deadlock, Roy-Hart scored the decisive two runs in the eighth on an RBI single by Hunter Babel and a bases loaded walk to Thomas Russo. The combination of a leadoff single by Charlie Brigham, a wild pitch, a sacrifice bunt by Walker Samanka and two intentional walks had loaded the bases to set up the opportunity. Samanka, who came on two hurl the final two frames, then locked up the Rams win by facing only four batters in he bottom of the eighth getting the outs on two groundouts and a strikeout. Charlie Bruning delivers a pitch for the Rams. With the win, Roy-Hart improves to 2-0 in N-O action while Medina slips to 3-1. Medina had grabbed a 1-0 lead in the third inning on an RBI single by Nate Sherman. Roy-Hart though answered right back with two runs in the top of the fourth with two outs on an RBI single by Karl Darling and an error. Medina did regain a 3-2 lead in the fifth inning on a wild pitch and an RBI single by Chris Goyette after an error, a walk and a balk put runners to second and third. However, the Rams again answered right back, this time with a run in the top of the sixth on a double by Charlie Bruning and an error to retie the contest at 3-3. The Mustangs did get a runner to third in the home half of the sixth but could not capitalize as Russo made a nifty catch at second base for the final out for the Rams. The Roy-Hart defense then came up big in the bottom of the seventh as catcher Noah Hardy threw runners out two runners to quickly shutdown a Medina comeback bid. Brian Fry led off with a single for the Mustangs but was thrown out by Hardy at second base. Sherman then reached on a walk but ended up being thrown out at third by Hardy and Samanka followed up with an inning ending strikeout. Bruning pitched the first six innings for the Rams allowing 4 hits and striking out 8. Samanka then allowed just 1 hit and struck out 2 over the final two frames. Trveor Luthart pitched the first six and one-third innings for the Mustangs scattering 5 hits and striking out 9. Medina next hosts Akron and Roy-Hart entertains Wilson at 4:45 p.m. Wednesday. Lyndonville defeated visiting Barker 17-7 in a non league game as Rolland Balcerzak and Nate Dillenbeck both had 3 hits and Oskar Heinsler, Kane Flynn, Matt Hess and Zach Johnson 2 apiece. The Albion at Wilson N-O League game and the Lyndonville at Newfane non league contest were both postponed. Roy-Hart first baseman Walker Samanka, who ended up picking up the win on the mound, takes a throw as Medina’s Brian Fry dives back to the bag.